When I used to tell people I lived in London (and then in Rome), people would tend to squeal in excitement and tell me how lucky I was. Now that I live in Brussels, I don’t get quite the same reaction when I tell others where I live. Brussels is a good place to live, but it is certainly not the most exciting capital city Europe has to offer (heck it isn’t even the most exciting city Belgium as a country has to offer). Yet after growing up in Germany and having lived in a tiny village in Austria, London and Rome, there are plenty of things I really appreciate about Brussels. Rents are low, the city is very walkable, there are plenty of green spaces and the airport is within easy reach from the city centre. But you know the best part about living in Brussels? The markets. Sure, I used to go to the farmer’s market in London too, but if I did, I usually only went on weekends. Many of the markets were only open a few days a week and none was in a location that meant I could do my food shopping there during the week. It wasn’t much better in Rome, where frequent trips out of town made it hard to seek out markets on the weekend. That all changed when I moved to Brussels. Here in Brussels, I am truly spoilt. On Monday nights there is the market by the Parvis in Saint Gilles. On Wednesdays there is the market in Chatelain, conveniently located a mere 10 minute walk from my office – meaning that most weeks I manage to either buy food during my lunch break or on my way home from work. And then there are the weekend markets, whether in Place Flagey or the one by the Gare du Midi, as well as several smaller neighbourhood ones. The only downside to being able to buy all my fruit and vegetables at the market is that I frequently buy far too much. So much so that last week I found myself with not 1 but 2 large butternut squashes taking up precious real estate in my fridge. While one butternut squash was turned into a vegetarian Madras curry for me to take to work, part of the remaining smaller butternut squash found its way into these little spiced cakes. And while the days are getting longer and there have been days so sunny that I am certain spring is finally on its way, the temperatures are still just about cold enough in Brussels for me to get away with sharing this recipe for butternut squash cakes spiced with Ras El Hanout with you. I have a fondness for all spiced cakes, whether it is a traditional cinnamon laced carrot cake with cream cheese frosting or a sticky ginger and treacle loaf. However, the more my spice cabinet has grown over the years, the more I have been interested in developing recipes around spice mixes not typically used for sweet applications. And while I have played with Garam Masala before, this was the first time I have baked with Ras El Hanout. While there is no definitive list of ingredients for Ras El Hanout it typically includes cardamom, cumin, clove, cinnamon, nutmeg, mace, all spice; ginger, pepper, coriander, pepper, paprika, fenugreek and turmeric. It is earthy with a little bit of a kick – something I have found pairs well with butternut squash in savoury applications (I like roasting wedges of butternut squash drizzled in olive oil and dusted generously with Ras El Hanout). As I have discovered making these small cakes, Ras El Hanout works equally well in sweet applications it turns out. Notes: While I like to grate carrots for carrot cake very finely, I prefer grating butternut squash quite coarsely when baking with it – butternut squash can get soft pretty quickly as soon as some heat is applied to it and grating it coarsely ensures the butternut squash does not disappear into the cake but gives the cake a bit of bite. While the rose blossom water in the glaze is optional, I like how its floral flavour stands up to this otherwise earthy and spicy cake. Pre-heat the oven to 175 degrees Celsius and grease 6 holes of a medium sized muffin tin. In a large bowl, beat the egg yolks and the sugar using an electric whisk. While beating, slowly drizzle in the oil. Once all the oil has been absorbed, add the egg whites in one go and beat until combined with the egg yolk mixture. In a separate bowl whisk together the brown rice flour, ras el hanout, baking powder and baking soda. Stir into the egg mixture. Lastly, fold the grated butternut squash and the chopped pistachios into the batter. Distribute the batter evenly among the holes of the muffin tin. Bake for 25-30 minutes or until the cakes are well risen and a wooden skewer inserted into the middle of the cakes comes out clean. 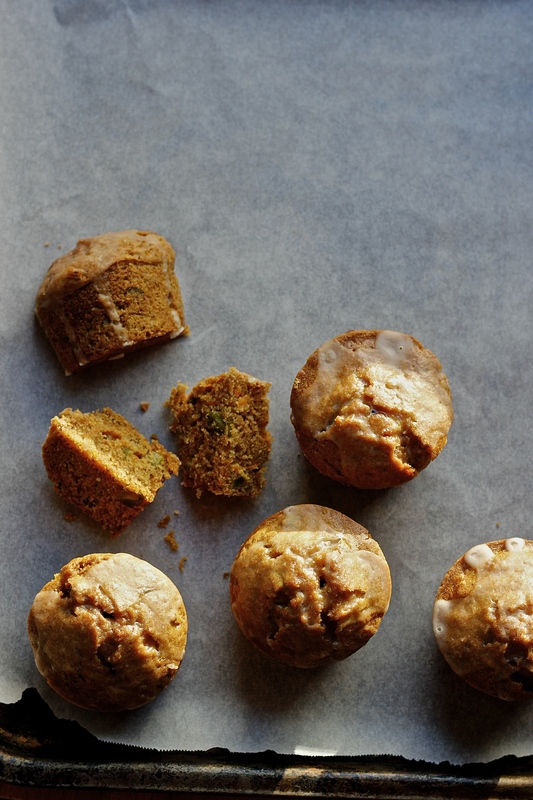 Leave the cakes to cool for 5 minutes in the muffin tin before carefully removing them from the tin and placing them on a cooling rack to come to room temperature. Whisk together the ingredients for the glaze and drizzle a couple of teaspoons on top of each cake. I’d love to make these gorgeous looking little cakes but I think the sugar is missing from the ingredients? I love your blog, your recipes are so intriguing! Thanks for pointing it out – I did indeed forget to list 90g sugar. I will amend the recipe to reflect this. I am glad you enjoy reading along!